Some people are drawn to the drama. This particular client, in a vibrant South Austin neighborhood, wanted their project to have that touch of extravagance. Once a duplex, this now two-story house was begging for more space and natural daylight. With a bigger kitchen and an expanded living room with floor to ceiling windows, we brought the outdoors in while kicking up the style. that was better suited for entertaining. By transforming the layout of the house and adding a 500 square foot addition, we freed up the front of the home to serve as a proper entry, included a new dining space complete with a buffet bar for extra storage, and, of course, created a new living room and kitchen that vastly improved the home’s functionality. New sliding glass doors and expansive windows add light and a sense of openness that the previous floorplan hid. Modern doesn’t have to be stark and minimalistic. This project weaves natural elements throughout the home, including knotty wood cabinets and a natural stone fireplace to keep the warmth and texture within the home while bringing in a slice of nature. Additional bits of high-end stylistic flair create points of interest, such as the backpainted glass backsplash and the two-story bookshelf. 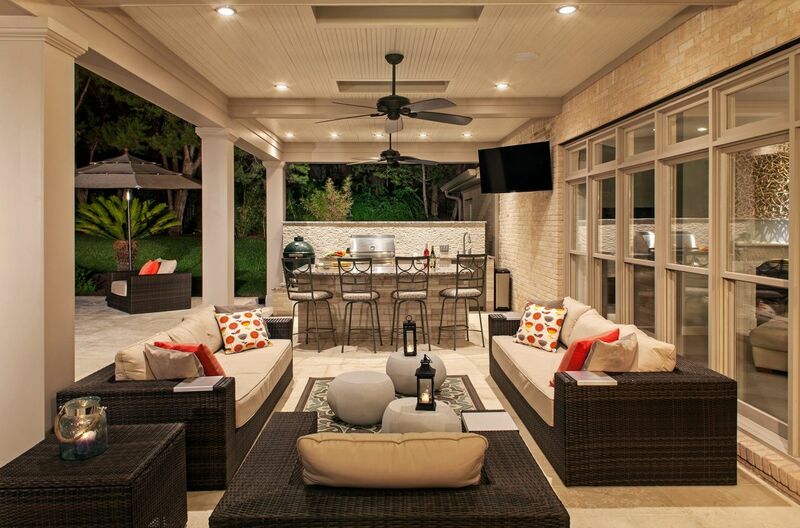 The space subtly reflects the homeowners’ personalities while providing all their desired functionality and style. The new kitchen was designed to entertain. Now, with a multi-tiered island clad with Calacatta Gold marble and a wrap-around butcher block dining table, guests can sit, eat and chat while the chef cooks. Knotty alder cabinets with a clear stain bring warmth and texture to the kitchen, while the backsplash is a sleek combination of back-painted glass and a fixed window that captures a piece of the outdoors. Additional storage and a bar counter were built in to the side of the dining room to house some of the clients’ collectibles and to function as a bar or buffet as needed. This two-story, open space looks onto the backyard with a wall of windows and new sliding glass door to bring the outside in and to fill the space with natural light. The new laundry room/mudroom is tucked behind the fireplace, which houses the backup refrigerator and ample storage space. 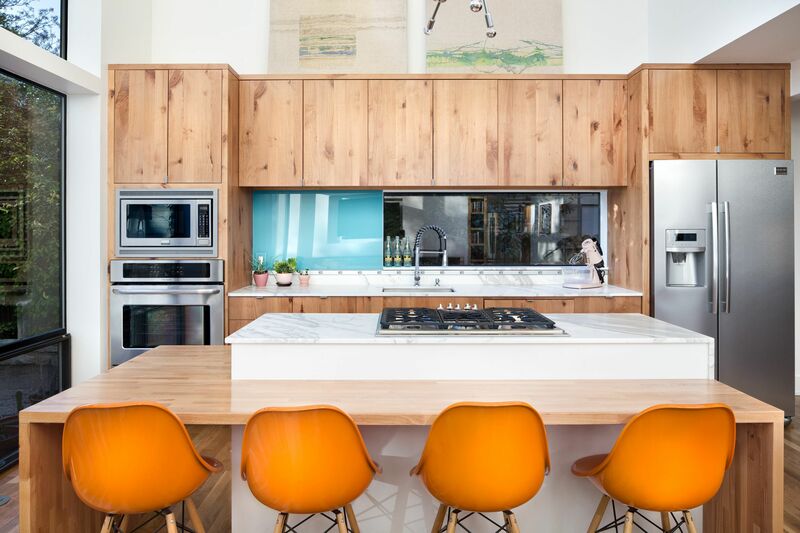 Butcher block countertops aesthetically tie this space to the kitchen. The homeowners now have a new daily entry point that is convenient but also out of the way, and capable of being closed off for entertaining. Originally a rental property, the home’s layout was disjointed and haphazard. The workspace was situated on one side under open shelving, but the sink, dishwasher, and stove were placed opposite, creating a very messy workflow. Aesthetically, the cabinets and counters were dated and mismatched, and the checkered linoleum floor tile wasn’t exactly easy on the eyes. inconveniently located between the sink and refrigerator—and simultaneously cut off the back yard and further complicated the kitchen space. The client longed to entertain and interact with guests while cooking, which was impossible given the current kitchen arrangement and the fact that the kitchen was a completely separate space from both the dining area and the living room. but in the intricate details overall. The linear fireplace, bookshelf, pocket door and mudroom niche space required some extra attention given the strict planar nature of the wall and the sheer number of elements occupying the same square footage—a true three-sided puzzle. Framing for this space called for precise accounting of complex clearances and recesses. The ventless gas fireplace had to be supported from inside the wall by framing, while its opening was sandwiched between steel plates, leaving no room for error. With new square footage came new opportunities. These homeowners now have a space that provides a tasteful environment to showcase their varied art and collectibles while being finely tuned to host friends and family.